SUNNY BUT COLD: Despite sunshine in full supply, temperatures are only in the 30s and 40s over north Alabama this afternoon, with 50s across the southern counties. Tonight will be clear and cold, but not as cold as last night. Most places will see a low in the upper 20s early Tuesday morning. RAIN RETURNS: Clouds move into the state Tuesday ahead of the next weather system to the west, and rain becomes widespread during the day Wednesday. The air will be stable, so there is no threat of severe storms, and probably little thunder. Rain amounts will be around one-half inch, with isolated heavier totals. Colder air begins to flow into the state late Wednesday night, and there is a chance a few snow flurries could develop from around midnight Wednesday night through daybreak Thursday, but for now we expect no accumulation or impact. The sky becomes partly to mostly sunny Thursday with a high in the 40s. Dry, chilly weather continues on Friday with a partly sunny sky and highs mostly in the low to mid 40s. 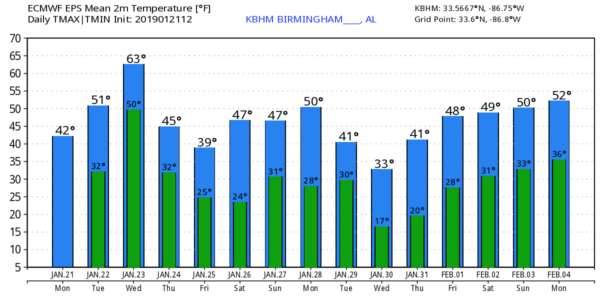 THE ALABAMA WEEKEND: Saturday looks dry and a bit warmer, with temperatures possibly edging up into the 50s thanks to a good supply of sunshine. An “Alberta Clipper” type system will bring some clouds into the state late Saturday night and Sunday, and it could squeeze out a little light rain. But new model guidance continues to trend drier, and we might even get away with dry conditions Sunday. The high Sunday will be in the 45- to 50-degree range with more clouds than sun. NEXT WEEK: Monday will be dry; then another clipper-type system will bring a chance of some light rain, or maybe a little light snow, next Tuesday and Tuesday night. Much colder air will follow the clipper on Wednesday; looks like we won’t get out of the 30s with a brisk north wind. There is no evidence at this point of any disruptive snow or ice event for Alabama over the next seven days, although a few flurries are possible late Wednesday night. SATURDAY’S STORM REPORTS: National Weather Service Birmingham identified four tornadoes on Saturday. The most significant was an upper-end EF-2 that moved through Wetumpka in Elmore County, producing significant damage. That tornado was 18.2 miles long with maximum winds of 135 mph; the maximum width was 700 yards. An EF-1 tornado touched down in Coosa County southeast of Rockford, and other EF-1 tornado damage paths were found in Dallas and Autauga counties.